Today is Lady Day, the Feast of the Annunciation, the instant of the Incarnation. However, 25 March is also the Feast of the Good Thief, St. Dismas! Fulton Sheen famously quipped of this theif saint that he “stole heaven”. And one of those robbers who were hanged, [Gesmas] blasphemed him, saying: If thou be Christ, save thyself and us. But the other [Dismas] answering, rebuked him, saying: Neither dost thou fear God, seeing thou art condemned under the same condemnation? And we indeed justly, for we receive the due reward of our deeds; but this man hath done no evil. And he said to Jesus: Lord, remember me when thou shalt come into thy kingdom. And Jesus said to him: Amen I say to thee, this day thou shalt be with me in paradise. It makes the heart ache, to read these words addressed to that penitent sinner. Would that they were address to each one of us. But wait! They can be. Holy Church has the Lord’s own authority to forgive sins, to loose and to bind! It is exercised by His bishops and priests! There is, by the way, a legend that, during the Holy Family’s flight from Herod to Egypt, they ran into Dismas, who was exercising his trade of thievery. Dismas was going to rob them, but seeing the Infant Jesus, he instead gave them shelter in his lair and let them go on their way without harming them. Dismas would continue to be a nefarious ne’er-do-well. His intellect still darkened by sin on Calvary kept him from recognizing Christ’s Mother. This entry was posted in GO TO CONFESSION, Liturgy Science Theatre 3000, Saints: Stories & Symbols and tagged St. Dismas, The Good Thief. Bookmark the permalink. 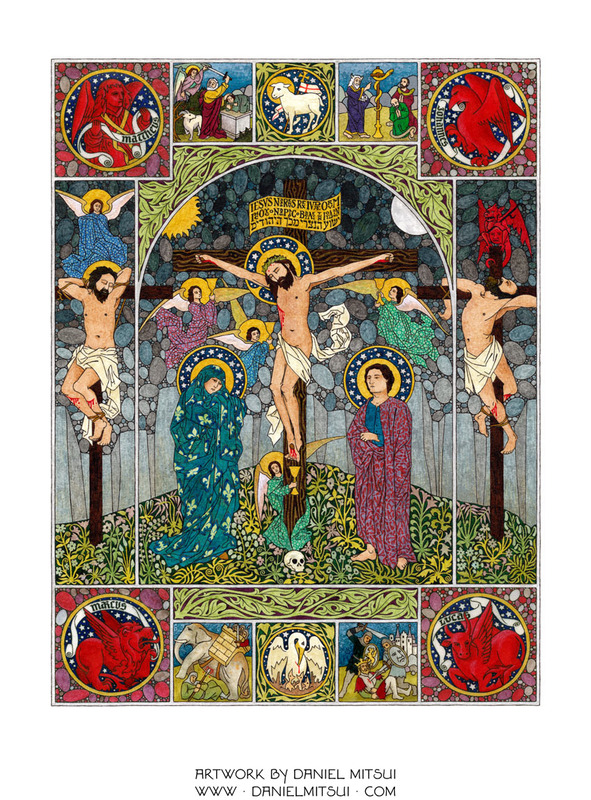 Thank you for sharing Daniel Mitsui’s Crucifixion. He does such beautiful religious art. I have two of his drawings at home. What is noteworthy is that *during* the Most Holy Sacrifice of the Mass (Calvary), one of Jesus’ servants (Dismas) rebuked someone who was profaning God and His Most Holy Sacrifice of the Mass. Ironically, this blasphemy/contempt for God occurred on March 25, 2019 during the Most Holy Sacrifice of the Mass in a certain diocese in the Midwest. No details are necessary. It is the same story – certain government entities have apparently committed grave evils, and they are trying to cover up those evils by falsely accusing an innocent person. They then spread the false accusations to priests and laity in attempt to ruin the reputation and credibility of the falsely accused. The priests and laity then willfully participate in mortal sin by profaning and blaspheming God during the Most Holy Sacrifice of the Mass. It happens on a regular basis. Several people are following the road to hell for their participation in these evils. Indeed, “sin makes you stupid”. Duplicity/lies makes a whole lot of people stupid – even certain people that claim to be “Traditionalist” or “conservative” Catholics. Sin is blinding you all, folks. It also makes certain government entities desperate – apparently desperate enough to resort to drugging/poisoning an innocent person in God’s House of all places. Mitsui artwork makes for highly-treasured gifts. He’s my favorite artist, and his hard work deserves everyone’s patronage. I have his drawing “the Four Last Things” in my breviary and it is magnificent! Daniel, if you read this, please consider doing a piece on the Marian Antiphons that are the proper size to fit in someone’s Breviary. Alternatively, maybe the Benedictus/Magnificat.